Joel Timm, senior lecturer, winds and percussion, is coordinator of oboe studies. Dr. Timm enjoys a distinguished career as soloist, chamber musician, orchestral player and teacher. Acting as associate principal oboe of the New York Philharmonic, he toured with the orchestra and made six recordings with Zubin Mehta and appeared as soloist. 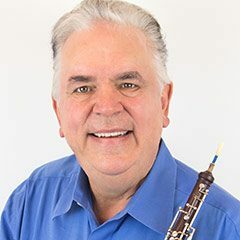 Dr. Timm has also served as principal oboist and soloist with the New Jersey Symphony, Philharmonia Virtuosi, Viruosi of New York and the orchestras of the Joffrey Ballet and American Ballet Theatre. He can be heard as soloist on several recordings for CBS Records, and has recorded chamber music for the Vox, Columbia, Vanguard, RCA and Musical Heritage Society labels. He is an active performer in the motion picture industry, as well as with such organizations as the Los Angeles Philharmonic, Los Angeles Master Chorale, Pacific Symphony and Los Angeles Opera.